I always become overwhelmed when I have not posted in more than a week; so much accumulates in my head to discuss in an upcoming post. I do not want to bore anyone but I also like to get everything that is nestled in my mind out onto this page. The first thing that I want to acknowledge is the sad things that have happened while I was on holidays. When I was in Regina I learned of a mudslide in Johnsons Landing (in the Kootenay region of BC) that killed four people. This event was particularly unnerving to due to the slide's proximity to our vacationing destination. Two days after the incident, Mike and I camped at a provincial park directly across the lake from the mud slide. We swam in the lake in the afternoon amidst debris which we inferred had entered the lake following the slide. With our binoculars we observed machinery digging through the wreckage on the other side of the muddied lake. A few days later, after some exhausting outdoor camping, hiking and swimming we opted to spend the night in a motel in Nelson BC. There, we learned of the horrible shooting in Colorado and must have sat in silence for an hour as we learned of the shocking event. I was contemplating earlier in the day the fact that I am nearing the age of 30. My initial reaction is to be weary of aging, but, in light of the recent aforementioned events, I am determined to just appreciate every day that I am alive whether I am as youthful as I want to be or not. As a wise friend of mine will tell you: every day is a gift. 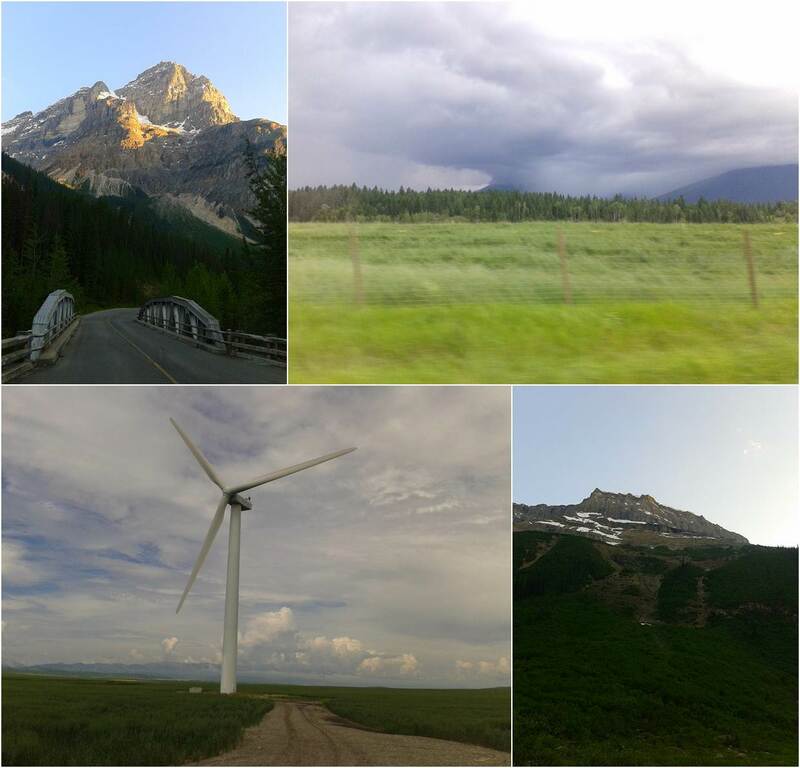 My holiday was centered around an 1800 km drive from Vancouver BC to Regina SK (to attend a wedding) and then a drive back another 1800 km; it was a tumultuous adventure. We spent our first night on the way to Regina SK in Yoho National Park. 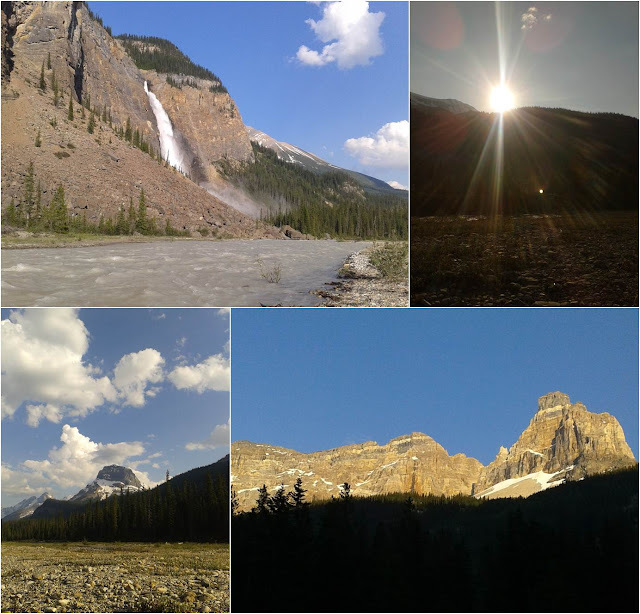 You may have been in this park if you have ever visited Lake Louise; in this park we stayed at a walk-in campsite near Takakkaw falls (pictured below). The next morning we drove the rest of the way to Regina, and stayed in Saskatchewan for 4 nights before finally returning to the eastern side of beautiful British Columbia. We spent the next five days vacationing in the mountains. Sadly and stupidly, I forgot my camera at home so all of our memories had to be captured on Mike's smart phone. We kicked-off this leg of the trip with an evening at Ainsworth Hot Springs followed by camping at Lost Ledge Provincial Park, situated on Kootenay Lake near Kaslo BC. In the morning we alternated soaking in the sun with swimming in the enormous lake. 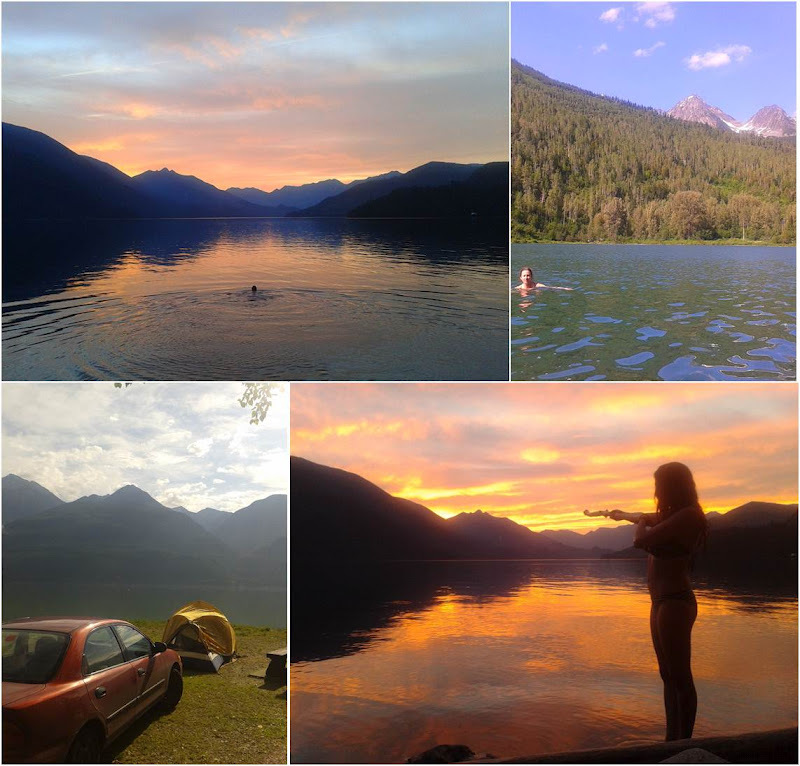 The next night we stayed at a friend's cabin's guesthouse near New Denver BC after swimming in Slocan Lake (pictured below). Swimming next to the beautiful sunset in this lake was a highlight of the trip; the water was calm and warm (in spots), the mountains were indescribable and no one was around. In the morning we went for a few short hikes in the area; to a viewpoint over Kaslo and then along an old mining trail. The hot day drove us to another swim in lovely Bear Lake. That evening we took a quick trip to Nakusp Hot Springs (not worth the drive out there) and spent the night at a campsite in New Denver. There we gazed upon shooting stars as they flew across the sky, cooked dehydrated lasagna over a tiny camp stove, and then woke up the next morning to the not-so-pleasant sound of RV generators. 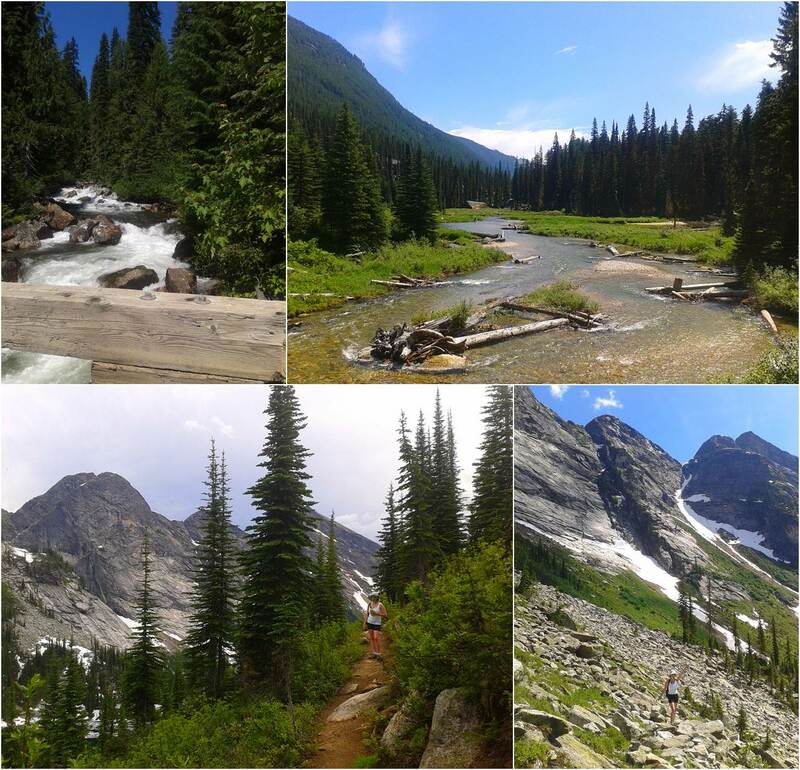 At the outset of the trip, Mike was eager to hike in Valhalla provincial park, an infamous grizzly bear sanctuary in BC, situated on the western side of Slocan Lake. I was less than thrilled at the thought and my hesitation caused some tension but Mike and I eventually agreed on a hike to Gwillim Lakes that crossed only the outside border of prime grizzly habitat. Unfortunately, driving to this hike, an hour and a half on rough gravel roads, was more than our 1996 Mazda Protege could handle. Our car overheated and the engine cooling fan ceased functioning. Despite the uncertain state of our vehicle we proceeded to the Gwillim Lakes trail-head armed with bear spray and bear bangers. Although our guidebook described the hike as "easy", it involved a 450 m ascending climb over 4 km of terrain, including a few scrambles across mountainous rock slides without clearly defined paths. The mountains and peaks that surrounded us during the hike were breathtaking. Despite my anxiety over grizzly bears we saw none, only an adorable creature that looked like a mouse crossed with a bunny. A storm started to roll in a couple hours into the hike, urging us to end the adventure early and return to our overheated car for a 1.5 hour drive back to the highway through the forest mining roads. That night, we drove to Nelson BC and stayed in a motel before driving to Osoyoos in the Okanagan. The following night, the last night of our holiday, we stayed at a lakeside motel near Okanagan falls and the owner of the lodge suggested we use his bikes to go for a ride along Skaha Lake. We brought our camping stove on the evening bike ride with the intention of making some backpacker's dehydrated green beans and mashed potatoes for supper. As Mike was scoping out a spot among some striking red boulders he spotted a snake. As he reacted to the discovery we heard the unmistakable sound of a snake's rattle. We hopped on our bikes as fast as possible and pedaled back to a bench further up the path, far from any boulders containing potential rattle snakes, to prepare and enjoy our dinner. The last day of our trip was again spent in the Okanagan, and we stopped in at the Blasted Church winery and Township 7 winery for some tastings. We picked up fresh local fruit further along the drive back home; fresh apricots, cherries, peaches and plums. Good apricots are hard to find so I picked up a huge batch with the intention of making a fruity galette when I got home. The urge to find out how apricots would taste on a pizza overwhelmed my desire to make a galette so last night I made a pizza with fresh apricot slices, roasted fennel and rosemary and Gorgonzola. The cooked apricot on the pizza was surprisingly tart and so I might suggest tossing it with some maple syrup before adding it to the pizza. I did not remember until the next morning that I had planned to garnish the pizza with fresh arugula. I'm plotting to make the pizza again soon to see how the arugula contributes to the pizza's ambiance. The dough here is enough for 2 or 3 pizzas. I always make 3 pizzas but try different toppings on all 3. So the amount of toppings you need depends on how many of the pizzas you make like this. The amounts specified below are enough for all 3 pizzas to be the same. If you want to try a slight variation I suggest trying apricots and Gorgonzola on a pizza with home-made tomato sauce and garnish after cooking with fresh arugula. 1 cup cold water (for overnight rising) or luke warm water (for 1 hour rising). 5. Option 1: Refrigerate dough for 12 – 72 hours. Take the dough out of the fridge about an hour before you are ready to press out the dough. 6. Preheat oven to 400F. 7. Slice fennel and toss with 1 tbsp olive oil, 1 crushed garlic clove, fresh rosemary and sea salt. 8. Spread the fennel out on a baking sheet covered with parchment paper. 9. Cook for 15 minutes and remove from oven. 11. Slice the apricots, crumble the gorgonzola and chop the arugula. Also, grate the parmesan and tear the bocconcinis in half. 14. Transfer flattened pizza dough to a baking sheet sprinkled with semolina flour or corn meal. 16. Drizzle a tbsp of good quality extra virgin olive oil onto the pizza and top with roasted fennel, apricot slices, crumbled gorgonzola and bocconcini. 17. Place pizza in oven (on baking sheet). 18. After 2 minutes, when the dough has firmed up, remove the pizza from the oven and shake it gently off of the pan and directly onto the pizza stone. Then switch the oven setting to broil (switching to broil is optional but I like the slightly singed effect it has on the crust). *Having the first 2 minutes of cook time ensures your dough is firm enough to not collapse as you struggle to get it on the stone. 20. Remove the pizza from the oven (I use a pair of tongs to pull the pizza back onto a pan or cutting board). 21. Sprinkle the pizza generously with fresh Parmesan and chopped arugula.